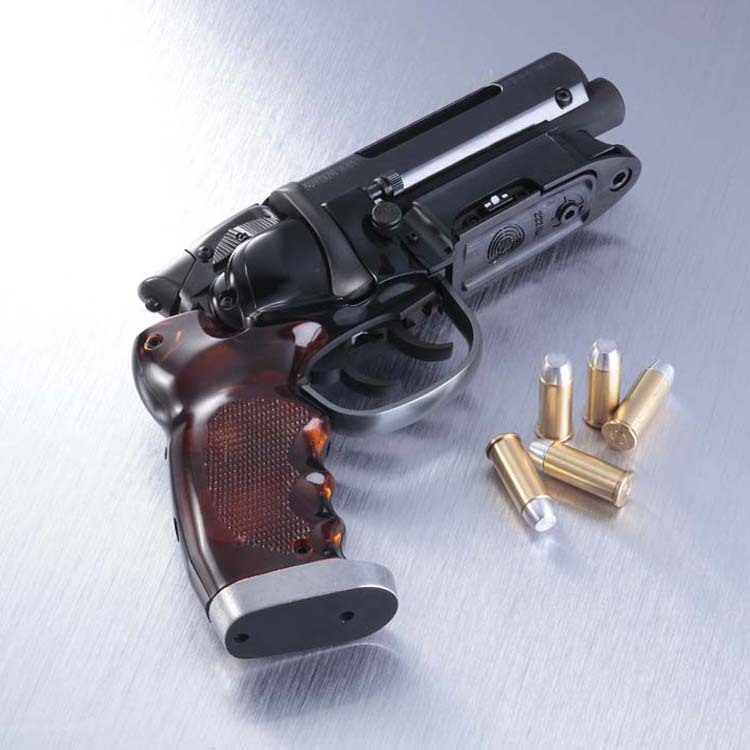 Blade Runner Blaster: Rick Deckard’s gun in Blade Runner is never given a real name, unlike many of the guns on our list but more than almost any gun, it has driven replica prop enthusiasts insane trying to recreate it thanks to its limited screen time and the somewhat challenging angles from which it’s seen. Still, it’s an incredibly cool gun. Made from a combination of a Charter Arms Bulldog revolver and a Steyr Mannlicher .22 Model SL, it strikes the perfect balance between fantasy and plausibility. The amber colored resin grips and small LED lights only make it cooler. 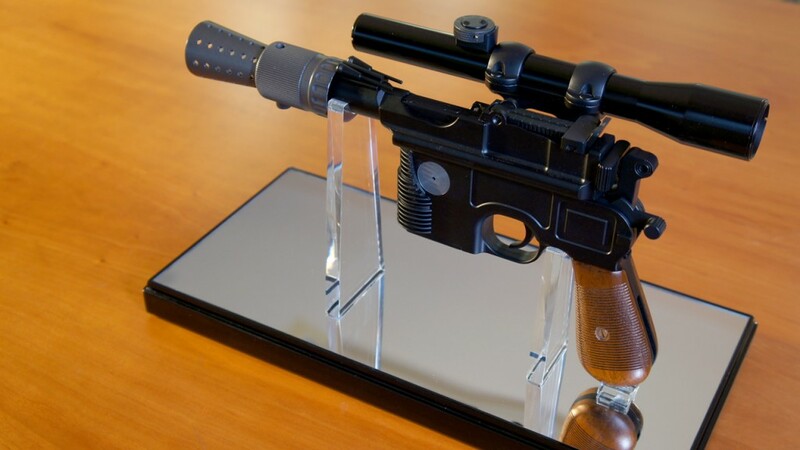 Han Solo’s DL44 Blaster: First, let’s just get this out of the way immediately: Han shot first. 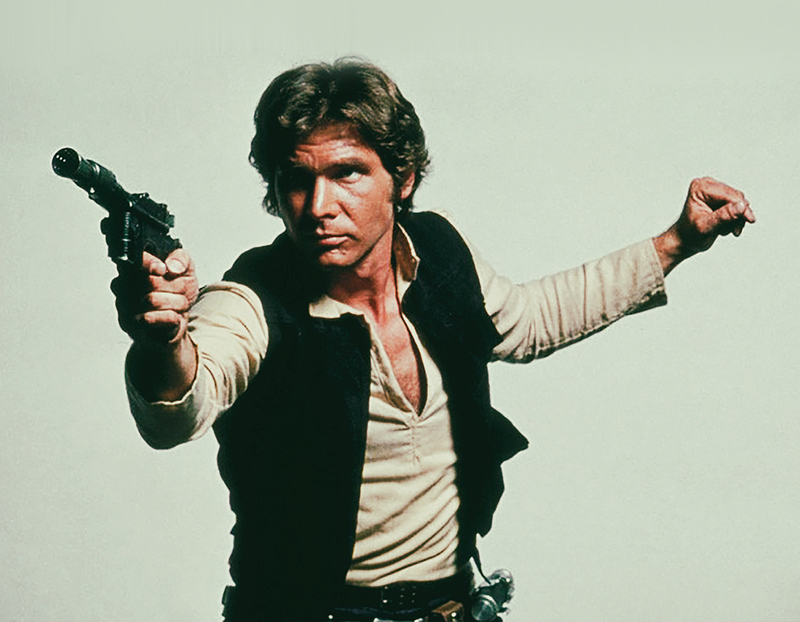 Now, the famous DL44 blaster pistol carried by Han Solo in Episode IV: A New Hope is one of the most iconic movie guns in history but like most movie guns, it’s based on a real firearm. In this case it is a Mauser C96 which was originally introduced in 1896. 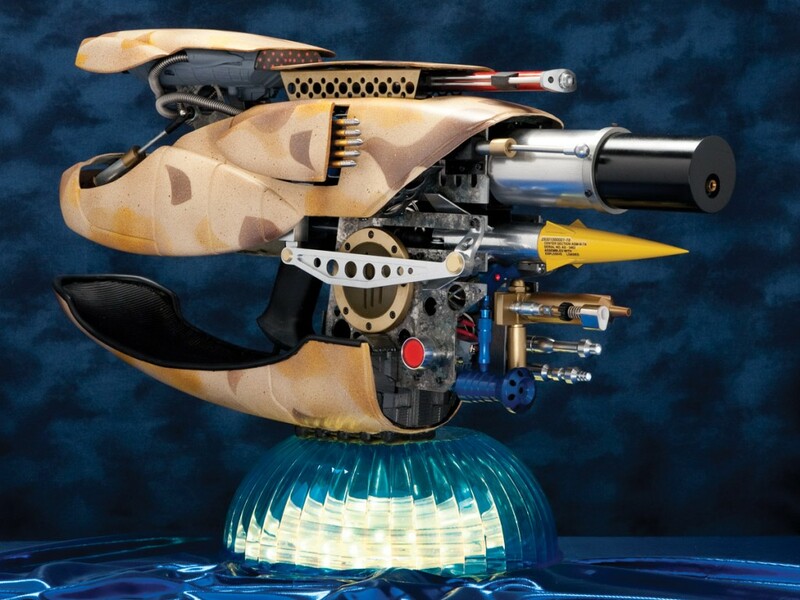 The London-based armorer who constructed the blaster for Lucasfilm used a gun which had already been featured in several other films and modified it with the famous conical flash supressor and sniper scope as well as model airplane engine parts to turn it into the vaguely spacey gun we know and love. Zorg ZF1: The Fifth Element may not have the same place in history as some of our other films on this list but the Zorg Industries ZF1 might just be the coolest futuristic gun ever. It features everything from a net launcher, a flamethrower, missile launcher, arrow launchers, machine gun with bullets that recall previous targets, and of course the little red button. It even folds up for easy carrying. What could be cooler? 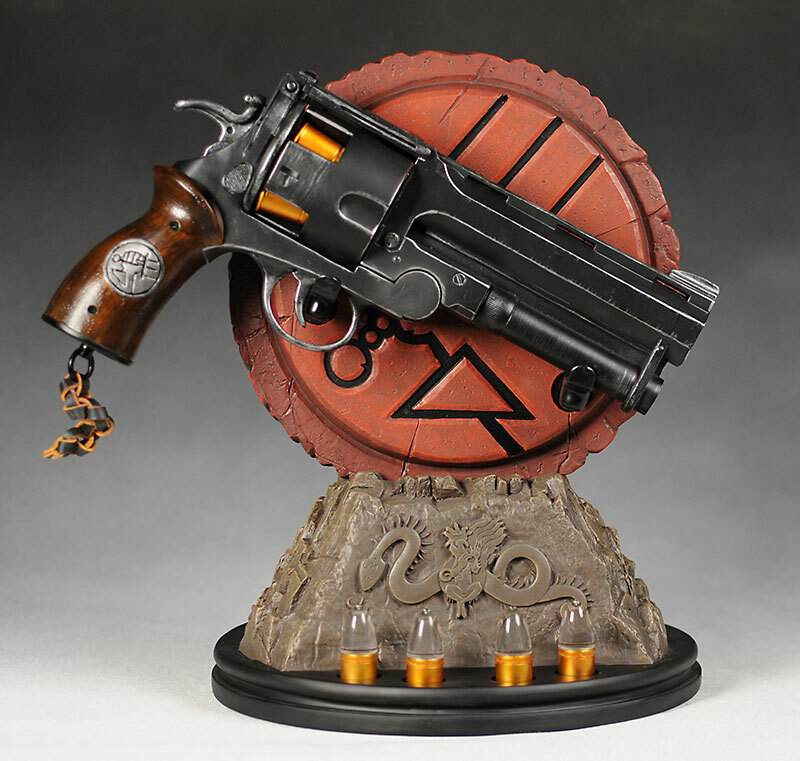 Hellboy’s Samaritan: Going toward the opposite end of the time spectrum, Hellboy’s Samaritan revolver is as unfuturistic as it gets. 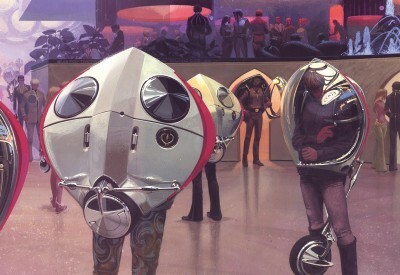 The Samaritan is a giant break-action revolver that fires similarly giant bullets ranging from standard lead to silver to “The Works” which each serve to help fell a different kind of foe. Hellboy is an admittedly crappy shot but thankfully, in true movie form, he always seems to have more shots in the gun than he should. It’s an unbelievably cool weapon in a movie filled with incredible props. Fingers crossed for a 3rd Hellboy movie at some point! SPAS-12: This is the only real gun on our list but when the Jurassic Park game warden, Robert Muldoon picked one up and headed out to fight the escaped velociraptors, the SPAS-12 was cemented as the coolest gun ever. 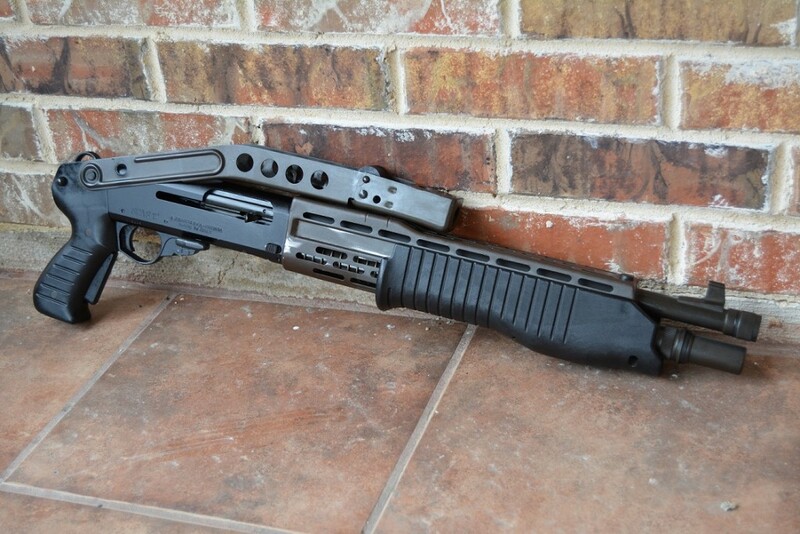 The Franchi SPAS-12 was pretty weird as far as shotguns go, having the ability to be fired as a semi-automatic weapon, pump-action, or manually. It also had the ability to handle low velocity less lethal ammunition and irritant rounds. The gun was incredibly expensive and wasn’t in production for a terribly long time, probably due in part to its lack of effectiveness against dinosaurs.